The following artical first appeared in Mullard's 'Outlook' brochure that they distributed to their various service departments and dealers. This particular artical was in their January 1961 issue. As most of the transistors used at present in radio receivers are made by the alloy-junction method, only this technique will be described. For the same reason, it will not be necessary to consider the production of n-p-n, silicon, or high-power transistors. The descriptions which follow therefore apply to germanium p-n-p transistors in general, and in particular to small-signal r.f. and a.f. transistors and medium-power output transistors. Thus the present article will be concerned primarily with the OC44 and OC45 r.f. transistors; the OC70 and OC71 a.f. transistors; and the OC72, OC78 and OC81 a.f. output transistors. To cover the production of a range of transistors it is necessary, of course, to concentrate on those processes which are common to all the types. The a.f. transistors just listed - the OC70, OC71, OC72, OC78 and OC81 - have a similar basic construction, the cross-section of which is represented diagrammatically in Fig. 1. The base layer is square or rectangular. The construction of the OC44 and OC45 differs from this in that the base wafer is round and the connection to the base layer is made by a ring-shaped tab which surrounds but does not make contact with the emitter pellet. These basic constructions, although at first sight comparatively simple, involve many complex techniques, many of which in the past have been confined to the research laboratory. 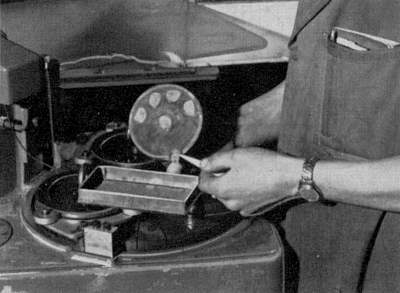 These intricate laboratory processes are now applied to quantity production in the Mullard transistor factories. germanium by heating in an atmosphere of hydron gas. as shown in this photograph. The most important raw material used in transistor manufacture is germanium. There are several interesting sources of this rare metal. Germanium is present in small proportions in the copper-bearing ores of the Katanga region of the Congo. It also occurs associated with zinc in S.W. Africa. Another source, and not the least romantic, is the flue dust produced by burning Northumbrian coal. Northumbrian coal contains about 0.02% of germanium. This is equivalent to about 1 ounce in 3 cwt. Burning the coal acts as the first stage in the extraction, the resulting flue dust sometimes being as much as 1 to 2% rich in germanium. The subsequent extraction of the germanium follows normal industrial-chemical practice. The germanium comes to the transistor factory in the form of germanium dioxide-a white powder. By heating the germanium dioxide for several hours in an atmosphere of hydrogen gas, the powder is reduced to the metal germanium. Chemical analysis would show the resulting germanium to be quite pure. But for transistor manufacture, a degree of purity higher than for any other manufactured article is required. Traces of impurity have an all-important effect on the conductive properties of germanium. The nature of the impurities and their concentration in the germanium have to be rigorously controlled. Otherwise the electrical properties will be unpredictable, and the germanium will be unsuitable for transistor manufacture. The purification is completed by a process known as zone refining. The refining is continued by this process until the impurities with electrical activity are reduced to the order of one part in ten thousand million-1 in 10^10. Put the other way, the germanium is 99.999 999 99% pure. This degree of purity was unheard of in metal working before the development of semiconductor devices. The impurity level, which is right outside the range of chemical analysis, is tested by checking the resistivity of the material. The ultimate degree of purity is achieved by zone refining. This process is based on the fact that impurities will concentrate more readily in the molten rather than in the solid metal. The zone refiner consists of a silica tube surrounded at intervals by r.f. heating coils. The bar of germanium, after being etched in chemicals to remove the scale from the outside, is placed in a graphite boat and inserted into the zone refiner. 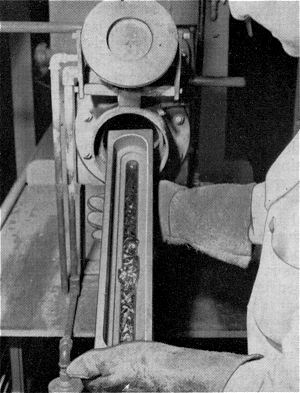 The graphite boat containing the ingot of germanium is drawn slowly through the tube. Each r.f. heating coil heats up the graphite boat by induction, and thus creates a zone of molten germanium. As the ingot passes through the coils, the zones travel the length of the bar. The impurities collect in the molten zones and are swept to one end of the bar. The principle of the process is illustrated in Fig. 2, which for the sake of simplicity is drawn for only one molten zone. The purity of the germanium is checked by measuring its resistivity. A small flat is ground along the length of the bar. Along this flat the resistivity of the bar is measured, centimetre by centimetre. The measurement is made by means of a probe having four prongs. The two outer prongs apply a known current, and the voltage drop is measured across the two inner ones. The greater the amount of impurity, the lower the resistance. At the end of the ingot containing the impurities from the zone refining, the resistance drops considerably. The point at which the resistance becomes too low is marked on the bar, and this end is cut off by a diamond-impregnated wheel and discarded. The initial purification is designed to eliminate unwanted imperfections from the lattice. Subsequent doping ensures that the imperfections are only such as to give the required p- or n-type conduction. The germanium in the ingot will eventually be formed into the base wafers of p-n-p transistors. Consequently this germanium needs to be made n-type, so that it will have free negative carriers. A known concentration of antimony must therefore be added to the germanium in the bar. The concentration of the antimony is to be about 1 part in 10^8. The process of introducing the antimony is known as levelling. This process is modified in such a way that the germanium is at the same time re-crystallised as a single crystal. The ingot of germanium as it comes from the zone refiner consists of many small crystals of different sizes, the axes of which are arranged at random. It is poly crystalline. Any sample taken from the ingot will consist of pieces from various crystals. Unwanted imperfections would therefore be present in the sample at the boundaries between the crystals. For consistent electrical properties, the ingot has to be transformed into a single crystal. To perform the combined operations of levelling and recrystallisation, the rod of pure germanium is placed in a silica boat lined with graphite. A short length of single-crystal germanium, produced during a previous refining, and known as the seed, is placed at one end of the rod. 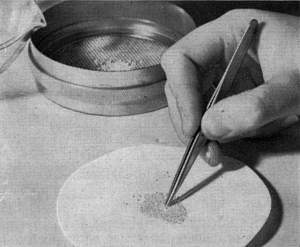 Between the seed crystal and the rod, small weighed pellets of antimony are inserted. The levelling and recrystallisation now proceeds by a process similar to zone refining, but using only one molten zone. The metal in the boat is heated by the currents induced in a ring of graphite. As the boat is drawn through the heated zone, a single crystal of germanium grows from the seed. By choosing the right width and speed for the zone, the antimony becomes evenly distributed throughout the length of the bar. A single crystal of n-type germanium is produced in this way. It is extremely hard, almost as hard as glass, and is usually cut with a diamond. It cannot be scratched with a steel blade. Before the next operation, the mono-crystalline bars are measured for resistivity, again using the four-pronged probe. The n-type monocrystalline germanium is required in the form of small, thin wafers. At a later stage in the manufacture, the p-type additive (indium) is infused into two regions on opposite faces of the wafer, to form the emitter and collector. The remaining non-infused germanium in the wafer will constitute the base region. The base of the transistor has to be extremely thin, and although the effective thickness is governed finally by the depth of infusion of the indium additive (Fig. 1), it is necessary to obtain thin slices in the first place. The rod of n-type germanium is cut into short lengths which are mounted on a plate and waxed to hold them firmly in position. These portions are now cut into sections or slices about half a millimetre thick. The cutter works rather like a miniature bacon sheer, but is equipped with several diamond-impregnated cutting wheels. The crystal is set at the correct angle in the cutter by means of x-rays. The cutting operation is automatic. 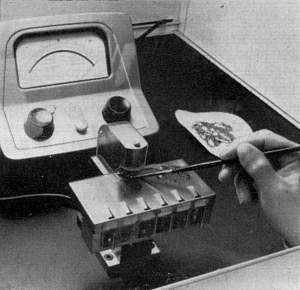 Removing slices of crystal after grinding. The slices obtained from the cutting machine are separated from each other and the wax is dissolved. The faces of the slices are now ground to remove those parts of the crystal which have been fractured by the diamond cutters. This is the lapping process. Lapping produces an incidental reduction in the thickness of the slices. The slices are separated by spacers in the lapping machines and are ground by successively finer abrasives. After lapping, the resistivity of the slices is measured, and they are sorted into groups suitable for various transistor types. Measuring the resistivity of germanium slice. still further, will form the base region of transistors. The cross-sectional area of the slices is quite large. Each slice, in fact, is cut up to form a large number of base wafers. The base wafers are square, rectangular or round, according to the type of transistor being made. Square or rectangular wafers are required for the small-signal and medium - power a.f. transistors. For the OC81, the wafers have to be 2.4 x 2.4 mm, that is, about a tenth of an inch square. The cutting of the slices is known as dicing. The slice passes under diamond cutters which score a parallel set of grooves on it. The slice is turned automatically through 90° at the end of the run. On the return journey, more score marks are made at right angles to the first marks. The resulting criss-cross of grooves, rather like those on a bar of chocolate, allows the slice to be separated easily into single wafers. Round base wafers, 1.45 mm in diameter, are required for the OC44 and OC45 production. These wafers are obtained from the slices by means of an ultrasonic drill fitted with a perforated bit. The final reduction in the thickness of the base wafers is made by etching. The wafers are placed in a small polythene basket with numerous small holes in its side and bottom, and the basket is agitated in the etching fluid. After this first etch, the wafers are automatically coarse-graded into batches according to their thickness. Each batch is then re-etched for a period of time depending on the average thickness of the wafers in the batch. After the second etch, the wafers are fine graded. Further corrections to the thickness are not carried out by etching, instead, in the subsequent alloying, the temperatures of the furnace are adjusted to suit the average thickness of the wafers in each of the fine grades. The thinnest base wafers are those produced for the OC44 and OC45.These wafers are only 100 µm thick - a tenth of a millimetre. At this still quite early stage in manufacture, the dice are worth more than their weight in gold. the emitters and collectors of transistors. To form the p-type emitter and collector regions, pellets of a p-type additive have to be fused to each side of the n-type base wafer. The p-type additive chosen is indium. Indium is a silvery metal, classed as a rare metal like germanium, and sufficiently soft to mark paper as do lead and graphite. Indium wire or strip is cut into portions containing the amount of material required for the pellets. The pellet which forms the Collector is three to five times the size of the one used for the emitter, according to the type of transistor. The process for shaping or 'balling up' the pellets bears some resemblance to that used for making lead shot. The pieces of indium are dropped down a glass tube about three feet high and filled with liquid. At the top the liquid is sufficiently hot to melt the pieces of indium into droplets. Further down the liquid is cooler and the drops of indium solidify into spherical pellets. is used which is accurate to ±0.5 microns. The alloying of the collector junction is carried out before that of the emitter junction. The collector pellet, the base wafer, and the base tab, previously tinned, are assembled in a jig. A moving belt carries the jigs through an electric furnace, the temperature of which is higher than the melting point of indium but lower than that of germanium. The molten indium penetrates the germanium to form an alloy of p-type germanium which is in intimate contact with the n-type base material. The jigs are now removed from the furnace, loaded with emitter pellets, and passed once more through the furnace. The furnace is divided into three temperature-controlled zones, the temperatures being controlled to within ±1°C on temperatures of the order of 650 °C. This close control is necessary because the depth of alloying, and hence the effective thickness of the base, depends on the furnace temperature. Although the germanium wafers with their alloyed pellets can now be considered to be true transistors, many operations remain to be performed before they can be of any practical use. The first of these operations consists in connecting the semiconductor material to leads passing through a glass foot by means of jumper wires. The tinned jumper wires have to be soldered to the emitter, base and collector regions of each unit-an extremely critical operation. Even a miniature soldering iron would be difficult to handle on such small components, and might introduce unwanted impurities. Instead, a stream of hot gas often serves as a source of heat. For the assembly of other types, the heat is provided by discharging a capacitor through the jumper wire. To ensure that the jumper wires are attached accurately to the emitter and collector pellets, the soldering is carried out under a microscope. magnetic conveyor belt in a washing trough for dispatch to the following process. After the intricate soldering operation, the flux is washed off by de-ionised (and/or demineralised) water, and the assembly is etched. The etching removes surface contamination, and prevents short circuits from occurring across the emitter and collector junctions at the points where the non-alloyed residue in the indium pellets meets the base material. The assembly is submitted to a further wash in demineralised water to remove the chemicals used for etching, and then passes through a drying oven. 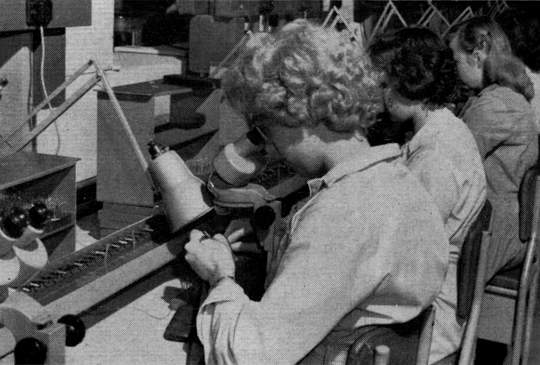 Before the transistors are encapsulated, they undergo an electrical pretest. To prevent contamination, the pre-test is made in a hermetically-sealed dry box containing a nitrogen atmosphere of controlled humidity. The transistors are now ready for placing in their glass bulbs. The envelopes are first filled with a special silicone compound which will protect the transistor from moisture and help to conduct heat away from the semiconductor material. 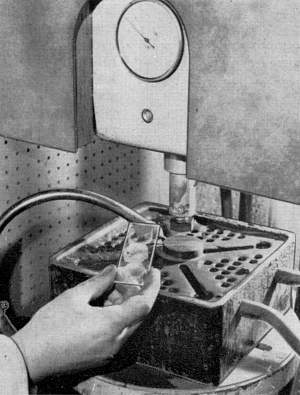 The seal between the glass bulb and the foot is made either by electrically generated radiant heat, or by a gas flame on equipment looking like a scaled-down valve-making machine. Sample transistors are double tested for ineffective seals. In the first leak test, the transistors are submerged in a mixture of methylated spirit and red dye. The penetration of the red dye into the envelope reveals transistors suffering from gross leakage. The second leakage test is really a tropical test, to which again sample transistors are submitted. The test lasts three days, during which the transistors are subjected to three on/off cycles of high temperature and high humidity. If the envelope is at all leaky, the performance of the transistor will deteriorate markedly and it will be rejected at the final electrical test. It only remains for the bulb to be painted, or fixed in a metal can, and for the type number and other marks to be applied. Although the spacing of the leads indicates which is for the emitter, base or collector, a coloured spot is placed on the case opposite the collector lead for greater ease of identification. A comprehensive system of quality control is applied throughout the manufacturing process. 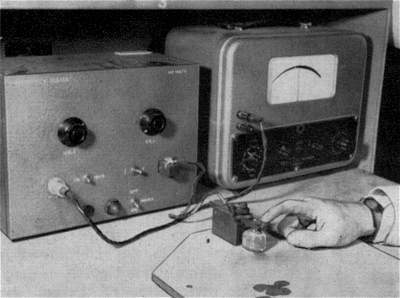 On completion, the transistors undergo a series of exhaustive tests. In this way, Mullard engineers ensure that only transistors of the highest quality and reliability reach the consumer.